Relevance Alpha synuclein is expressed predominantly in the brain, where it is concentrated in presynaptic nerve terminals. The deposition of the abundant presynaptic brain protein alpha-synuclein as fibrillary aggregates in neurons or glial cells is a hallmark lesion in a subset of neurodegenerative disorders. These disorders include Parkinson's disease (PD), dementia with Lewy bodies (DLB) and multiple system atrophy, collectively referred to as synucleinopathies. Parkinson's disease (PD) is a common neurodegenerative disorder characterized by the progressive accumulation in selected neurons of protein inclusions containing alpha-synuclein and ubiquitin. A point mutation in the α-synuclein gene, Ala30-Pro (A30P), is linked to familial Parkinson′s disease. Notes pJEK4 ("A30P") is a derivative of pET15b with the open reading frame encoding the A30P mutant human a-synuclein cloned in via the NdeI and BamHI restriction sites. 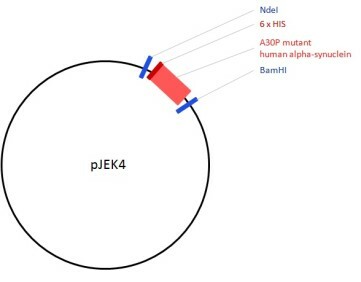 It was constructed via site-specific mutagenesis of pJEK1, replacing the G at position 88 in the ORF nucleotide sequence with a C, thus altering the 30th codon from GCA encoding Ala, to CCA encoding Pro. In this construct A30P alpha-synuclein is expressed as a fusion protein with an N-terminal six His tag. Linked to 8 other reagents on Ximbio.